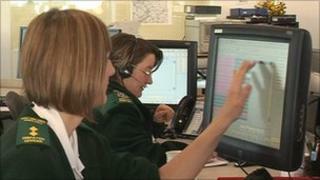 The East Midlands Ambulance Service has said it is prepared for one of its busiest times of the year. The service is anticipating a 10% rise in injuries caused by slips, trips and road accidents caused by crowded roads, freezing weather and festive revellers. A spokesman said they had prepared ambulances for icy roads, brought in four-wheel drive vehicles and deployed more control room staff. People were also asked to only ring 999 in a full emergency. Richard Henderson, Assistant Director of Operations at the East Midlands Ambulance Service, said: "We have additional 4x4 vehicles available and we have put a significant amount of extra resources out there, both in traditional ambulances , 4x4 vehicles and fast response vehicles. "We have also worked closely with partner organisations and voluntary organisations to ensure we provide a robust service and are prepared for all weather situations." A recent report said patient safety at the service was improving, after it was criticised for cleanliness, infection management and response times. It covers six counties and handles more than 600,000 emergency calls a year.